Marlins’ Jose Urena drops appeal of suspension for hitting Ronald Acuna Jr. Tue., Aug. 21, 2018, 4:26 p.m.
MIAMI – Marlins right-hander Jose Urena dropped his appeal of a six-game suspension for intentionally hitting Atlanta rookie Ronald Acuna Jr. with a pitch. Urena began serving the suspension Tuesday. 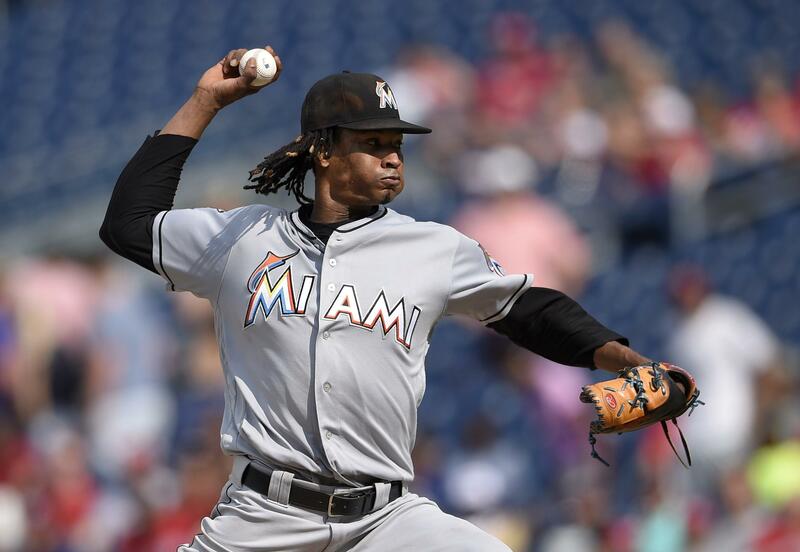 The Marlins, fearful the Braves might retaliate, had already decided Urena wouldn’t pitch against them during a four-game series later this week. Urena is expected to return at Boston on Aug. 28. He hit Acuna on the left arm with his first pitch, triggering a melee in the Marlins’ 5-2 loss in Atlanta last Wednesday. Acuna went into the game having homered in five straight games, including four homers in the three games against Miami – three of them leading off. Acuna left the game injured but was back in the lineup the next day. Urena was ejected. His next start came Sunday, when he pitched a two-hitter for his first career complete game to beat Washington 12-1. Published: Aug. 21, 2018, 4:26 p.m.